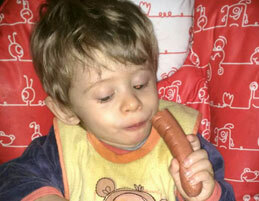 Khalil’s adorable little grandson Daryl – two years old - is often requesting our jumbo sausages – and eats them with pleasure. We feel obliged – but also delighted - to send Khalil a new shipment of Robert sausages – so Daryl doesn’t get disappointed. We are proud that Daryl is a fan of our products.